After nights like these, you don’t know whether to feel optimistic for the second leg or not. There’s no doubt that Liverpool got away with it, especially in the second half when they had to defend valiantly for practically the whole 45 minutes, and their record suggests that this is what they do best – soak up the attacks, frustrate and then hit back an Anfield. On the other hand, if the team plays anything like they did tonight at Anfield, Liverpool’s solitary away goal will surely be matched. The opening exchanges were cagey, but as both teams settled Arsenal took hold, Van Persie looking lively, volleying over from a superb Flamini pass and then forcing an excellent save from Reina. A goal was coming, but how it came about was the surprising part. It is easy to forget that van Persie’s set piece expertise isn’t restricted to free kicks, he delivers deadly corners too, and his superb cross found Adebayor unmarked six yards out, having the simplest job of heading home. Liverpool’s defending was woeful, splitting badly and giving the biggest man in the box the freedom of London. The lead didn’t last long, and there was as much culpability for the equaliser as there had been for the opener. Gerrard rode some weak challenges to square for Kuyt, who was stronger than Clichy in forcing the ball home. Suddenly the tide had turned, and the team seemed rattled, perhaps an indication that confidence levels were still at fragile levels. Gallas and Senderos were marshalling Torres superbly, but Carragher was harrying Adebayor in equal measure and the game became compressed. It didn’t help that Hleb was struggling on the left, while Eboue was contributing absolutely nothing on the right. I missed the first minute of the second half, but was delighted to see Walcott on, wrongly assuming the hapless Eboue had been hauled off early. Not the case, Van Persie picking up another injury, but Wenger claims that it was only a precaution and he should hopefully be fit for the second leg. Walcott fired a piledriver wide, while Hleb began to thrive in the support striker role he loves so much. And then came the moment that leaves a bitter taste in the mouth – Hleb made a stunning run, dancing between four players, before Kuyt clearly grabbed him arm and hauled him down. What made it galling was the view of the referee, five yards to the side of the offending arm, with an unbroken and perfect view of the incident. Inexplicably, he didn’t give the penalty. Otherwise, it should be noted, he had a decent game, trying his best to let the game flow and keeping his cards in his pockets for the whole match. But he bottled his biggest decision. Still, with Reina such a adept penalty saver and Van Persie off the field, a goal was by no means guaranteed. The game still should’ve been won, Cesc’s goalbound poke being stopped on the line by Bendtner, who got his legs tangled trying to get out of the way. It was an unfortunate moment more than anything, criticism cannot really be levelled at the striker, who just wasn’t fleet footed enough to step over the ball. The last twenty minutes were full of nearly moments, admittedly with Liverpool occasionally looking dangerous on the break. But in the end, the defences came out on top, nullifying every threat that came their way, and the match ended all square. No doubt the media will now favour Liverpool, and I’m sure in the reverse situation we’d now fancy our chances. But Benitez has a strange tactical mind – not needing to score, they may try to keep things tight next week and invite pressure, which is likely to be a terrible mistake. They tried to shut up shop at Anfield in the league early in the season after scoring early, and failed. In fact, they should’ve been well beaten that day. Liverpool will be happy with this result, but there is no reason for us to be downhearted. We were the better team, and also were at Anfield months ago. Don’t forget the two cups wins at Anfield last season either, it is not the fortress it once was. Had they got two away goals, we would’ve been in real trouble, but there is no reason we can’t score the one goal we need. Before then, we need to continue the second half momentum by claiming three points on Saturday. In amongst all this positivity, I cannot fail to mention Eboue, who was utterly hopeless tonight. On one occasion he could’ve scored had he gambled and attacked a cross from the left, on another he sliced wildly. Every time he tried to beat his man he lost the ball, his delivery was poor and he even managed to get in a trademark dive when he would’ve been in a decent position had he stayed on his feet. 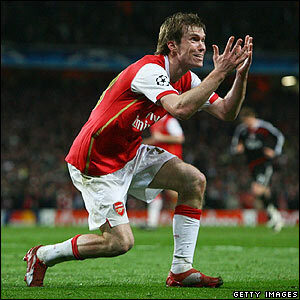 This time last season many were questioning Hleb’s future, as the most infuriating player in the team. But at least with Hleb you could see what was happening, and now and then the Hollywood balls he would attempt came off. And he always tried his best. Eboue, on the other hand, isn’t a goal threat, is a red card waiting to happen, and simply serves no purpose in this team. The trouble is, Diaby isn’t playing well, Rosicky’s injured, and Walcott remains an effective substitute, so options are limited. I just don’t see what he offers that others do not. We have young players able to step up, why not give them a chance now that players need a rest? Maybe he’ll prove me wrong and score the crucial goal an Anfield next week. I won’t hold my breath.